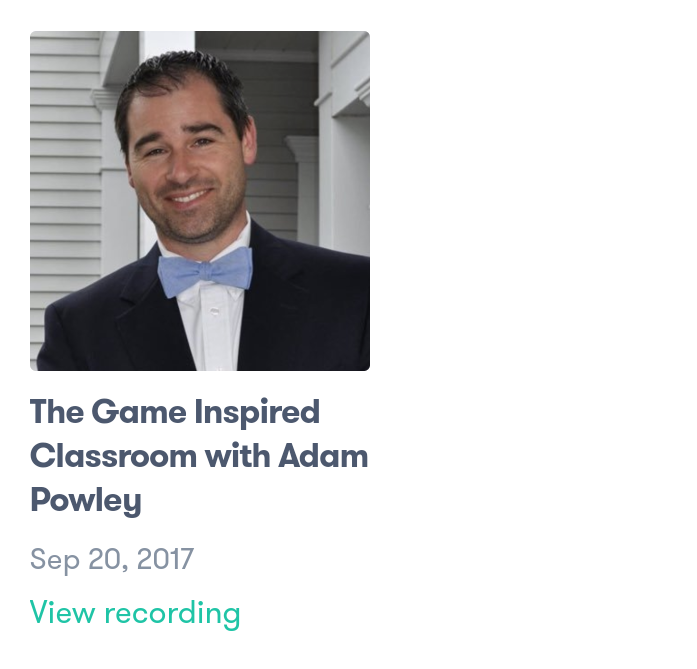 I am very excited to share a link to the recorded Game Inspired Classroom Webinar from Wednesday 9/20. I was asked to present this webinar as part of the Innovations in Game-Based Education series for the University of North Carolina. The recording is 43 minutes and covers my experience with using Narrative as a motivator and unit structure, XP Grading, and a bit with avatar/player types. There are also some excellent questions starting around the 15 minute mark. The most best part of hosting the webinar were the people involved. Lisa Dawley invited me to participate in the series. The Innovations Series is her initiative. Lisa and Beatrix Hutton did a fantastic job running the event and I would encourage everyone to register for the remaining webinars or find the recordings afterwords. The series will have sessions on VR, e-sports, and other interesting ed related subjects. The work they are doing for games in ed look fascinating. Definitely follow Lisa on Twitter at @lisadawley. Just as outstanding are the supportive community of Gamified (or at least game curious) educators. Over 30 people registered for the webinar and several names jumped out at me as I found moments to glance at the backchannel chat during the webinar. I recognized Garrett (@PBJellyGames) and Nick (@Slapshot99) from #xplap and #games4ed and I am sure there were several others that I didn’t catch in the fast past discussion (If I missed you I am sorry). The gamified educator community is feeling more like a second family every day. Thank you all for the encouragement and kind words both before and after the webinar. As always, I left with some new contacts, new insights, and new questions. If, after watching the recording, I can provide any answers or if a line of discussions can be had please contact me. I look forward to continuing on this game inspired journey with you all!